BUTTE, Mont. – As the spring waterfowl migration begins, managers at the Berkeley Pit in Montana are considering setting up lasers and cannons to prevent another mass landing – and the subsequent deaths – of thousands of geese and other waterfowl. Last November, an estimated 3,000 to 4,000 snow geese, Ross’s geese and ducks died after landing on the toxic stew of acidic water in the 900-foot-deep former mining pit, which is part of the largest Superfund site in the nation. While the official cause of death hasn’t been released, most of the waterfowl probably suffered internal organ failure, along with external burns, according to Ryan Moehring of the U.S. Fish and Wildlife Service. Montana Resources personnel, who manage the former open-pit copper mine with BP-owned Atlantic Richfield Company, were shocked when they discovered the dead birds, which nearly covered the 1-by-1.5-mile pit. Previously, 342 snow geese that perished in the pit in 1995 held the record for the highest waterfowl death count in one season. The companies then developed plans to prevent additional deaths, and until Nov. 2016, only about 200 birds died after landing on the pit’s water. But on Nov. 28 of last year, tens of thousands of birds landed on the Berkeley Pit. “It wouldn’t have surprised me if we had 50,000 to 100,000 in the area; when you start picking up birds on Doppler radar in multiple groups, you have a lot of birds,” said Mark Thompson, the environmental affairs manager for Montana Resources, in an interview. Although the pit managers employed their usual hazing methods of shooting multiple rifle rounds into the air and setting off fireworks to try to spook the geese that night, many of the birds refused to leave. By the next morning, it was too late. So this time, Montana Resources and Atlantic Richfield plan to bring in the big guns in the forms of cannons, lasers and possibly firearms. They’ll also employ water and aerial drones to harass the waterfowl. The Environmental Protection Agency, the state Department of Environmental Quality, and the U.S. Fish and Wildlife Service must approve the plan before implementation. Thompson said that after conferring with waterfowl experts, Montana Resources and Atlantic Richfield are going both high- and low-tech to keep birds off the pit. First, they’ll monitor migrations more closely, to know when they should be on high alert. When flocks are nearby, pit managers want to employ up to six propane cannons that will randomly discharge without actually shooting anything to scare the birds away from landing. They’ll also use “Phoenix Wailers” that have pre-recorded sounds like the danger warning noises birds make, helicopters and shotguns to scare birds away. And they’re considering installing green laser lights to mimic the eyes of predators. Finally, if the birds do land on the pit again, Montana Resources’ employees may shoot warning shots from rifles – similar to what’s done now – and use aerial and water drones to harass the waterfowl. Thompson isn’t sure of the final cost for these measures, but said Montana Resources and Atlantic Richfield are determined to ensure the mass death of waterfowl at the site won’t happen again. “We saw how hard this was on our employees, on our communities and on our companies,” he said. Dave Palmer, the Butte/Silver Bow chief executive, didn’t respond to multiple phone calls and emails regarding the impacts of the loud noises on city residents, or whether the city is planning any mitigation efforts. Thompson said they’ll try to position the cannons to lessen the noise impact on the public. Migratory birds are under federal protection, and the mine owners could be fined up to $5,000 per dead goose and duck if their efforts at deterrence fail. Moehring said the investigation into the previous waterfowl deaths is ongoing, and no decisions have been made about the finds. “We can’t make a determination of culpability before we know all of the details,” he said. 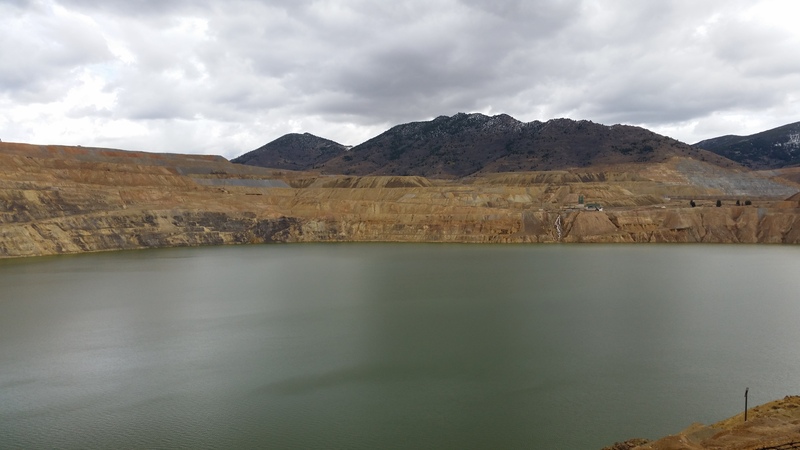 Copper and other metals were discovered in the mountain that later became Berkeley Pit in the 1860s. Miners’ removal of ore and recovery of metals eventually reduced the mountain to a 1,780-foot pit. Large pumps that had kept water out of the pit were turned off in 1981, and it filled with groundwater that turns acidic when mixed with earth and air. It also contains arsenic, cadmium, zinc, sulfuric acid and dissolved heavy metals. Montana Resources and Atlantic Richfield are pumping and treating some of the water flowing into the pit, but can’t capture all of it, and the pit is continuing to fill. By 2019, a water plant must be in place to pump and treat, then discharge, the pit’s water, and it must be operating by 2021. Without it, the pit is expected to fill by 2023, which could contaminate Butte’s drinking water.